This might have slipped your attention, but during the last few years a new genre was born. Incredibly engaging, addictive, wildly popular – namely, clickers. The best part is that they basically complete themselves. Perhaps you’re among the few people who have witnessed their infancy. Maybe the first time you heard about them was in 2013, when they received some publicity and were recognized as an emerging genre. Or maybe it wasn’t until June 2015, when Lord Gaben himself contributed to their increasing popularity during a summer sale on Steam. Or maybe you haven’t heard the term until today. Clickers are a new genre of games, which has been gaining popularity at an admirable pace. Oddly enough, though, it all started with one videogame that was mocking the bad practices of the industry. And cows, too. There’s a good chance that you can remember the surge of popularity of Facebook’s browser and mobile games such as FarmVille – that was around 2010. Many people who knew a thing or two about video games were voicing their criticism quite openly – pointing their fingers at the aggressive monetization of the experience and the lack of ambition in approaching the production of these titles. Among those critics was Ion Bogost – a journalist and game designer. Back in July 2010, he was participating in a seminar on video games, where he wanted to address the issue of the dark side of social games. 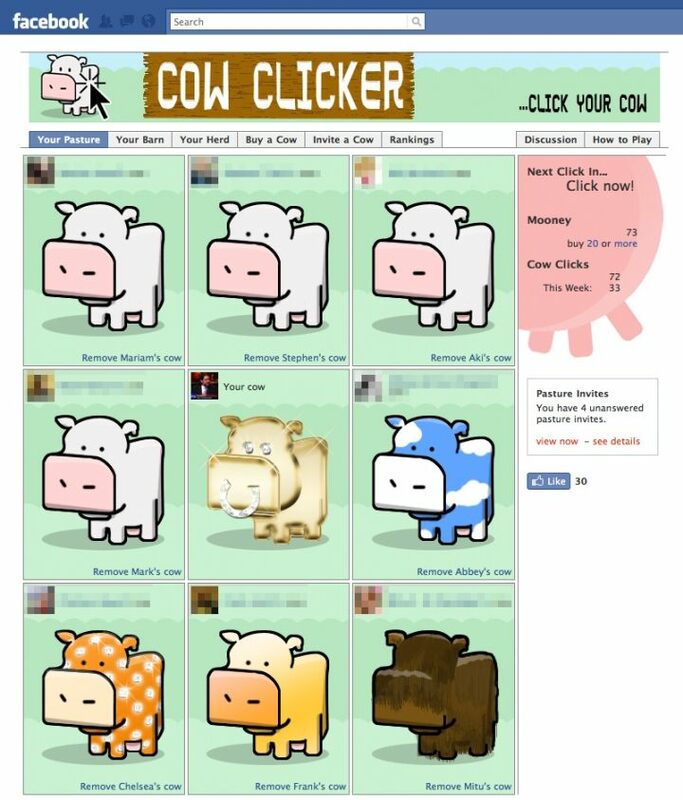 To make sure his message really stroke a chord, he had created Cow Clicker – a Facebook game that pushed the mechanics known from other games well beyond the frontier of absurd. In this game, which was basically written between lunch and dinner, players could click on a cow every six hours, thus earning one point. If your friends were playing as well, you could also click their cows, earning an additional point for each. Beyond this captivating mechanic, the game also allowed you to buy some skins for the cow and to shorten the interval between clicks – for real money, of course. And that was about everything the game had to offer. Cow Clicker was the essence of the rotten practices of the industry. Cow Clicker in all its bovine glory and splendor. You would imagine Bogost must have been quite surprised when his “video game” rapidly started to gain popularity – during just two months, more than 50,000 people indulged in clicking the cows to their hearts’ content. 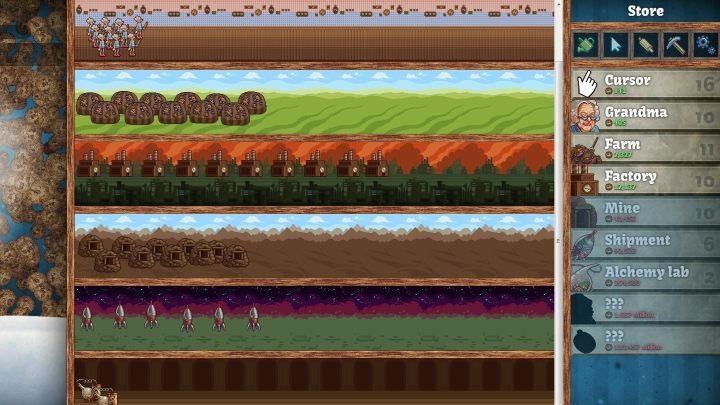 The creator of the game was somewhat taken aback by what was happening, but the gamedev instinct must have gotten the better of him – he expanded the game slightly, adding new types of cows and different kinds of rewards for surpassing the thresholds of clicks. The man used the unlikely popularity of his clicker to mock other practices of the industry – trends that he found disagreeable. Around a year after the game debuted, an event called “Cowpocalypse” was announced – in the game appeared a clock, counting down time left until the inevitable end. The players were able to postpone that unpleasant moment if they were only willing to spare a dime or two. And some actually did: the Cowpocalypse earned around 700 bucks. Eventually, however, the clock ran out. Clicking was still possible, but the cows disappeared. The accusations that the game became less interesting without them were largely dismissed by Bogost himself, whose allegedly thought that it was boring as hell anyway. Cow Clicker died, but its legacy remains. Numerous developers followed suit, creating games exploiting the mechanics of thoughtless clicking, seasoned with different additions. Some were moderately successful, but none managed to become a real mainstream hit. Apart from one, that is – the 2013 Cookie Clicker, which not only was a huge success, but also established the foundations on which almost all of today’s clickers are built. Cookie Clicker is for clickers what Wolvenstein 3D is for FPS. Sorta. Cookie Clicker was about cookies. And of course about clicking. In the game you baked cookies by pressing the left mouse button. This may sound simplistic, but bear with me. If you managed to bake enough cookies, you could buy upgrades – some of them increased the number of earned cookies, others let you buy buildings and grandmas (the workforce) that did the job for you. After some time, manual clicking would become pointless: your company was able to generate millions of cookies every second. The only thing left for the player to do was management: buying and upgrading. New farms and then factories. New alchemy labs; portals that snatched cookies from other dimensions; antimatter condensers capable of generating cookies from the very fabric of the nothingness of the Universe. But let’s not get sidetracked. Cookie Clicker became a real fad, with hundreds of thousands of players. The devs constantly furnished some minor additions. The game was free and sufficed for months of gameplay. 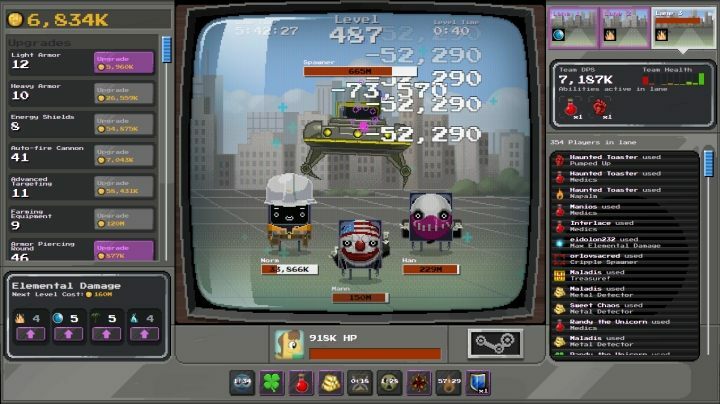 That’s when the name of this new type of games was coined – “incremental games.” The clickers captured browsers and smartphones in no time, just to launch an all-out assault on Steam in 2015, where, as Clicker Heroes and AdVenture Capitalist, they attracted even more players. Clicker Heroes. A thoroughly typical clicker. But a well-polished one at that. Almost perfectly, in fact – before I finally decided that enough was enough, the Steam counter showed some 6000+ hrs. If by mid-2015 someone still hadn’t heard about clickers, it was bound to change in June, when Valve decided to diversify the offer of their summer sale with their own, proprietary clicker. Monster Game introduced cooperation, and hundreds of players could now click together. It’s interesting that initially everything indicated that it would be a flop, mainly because the servers were totally overpowered by the millions of players yearning for them Steam cards. In any case, that game brought to light the fact that somewhere on the sidelines of the industry, a new genre had been born. But how has something that came to existence as a parody of the greatest flaws of video games become so popular? Well, it’s quite simple. These games utilize a very basic principle: the player feels regularly rewarded for his or her work. Even if they’re not crunching hundreds of hours into it, they still know that something is going on there – that the game is working for them. What’s more, they’re a great distraction while you’re doing something else on the computer; over six thousand hours of Clicker Heroes running in the background on my PC is no coincidence. Also, those are mostly free-to-play games with unobtrusive microtransactions, which you can play for moths, discovering new things all the while. But there’s also something more important: the best clickers, underneath a pile of meaningless actions, hide some clever mechanics and complex math. Monster Game. The servers had some problems at first, but the game eventually gathered a great many players. 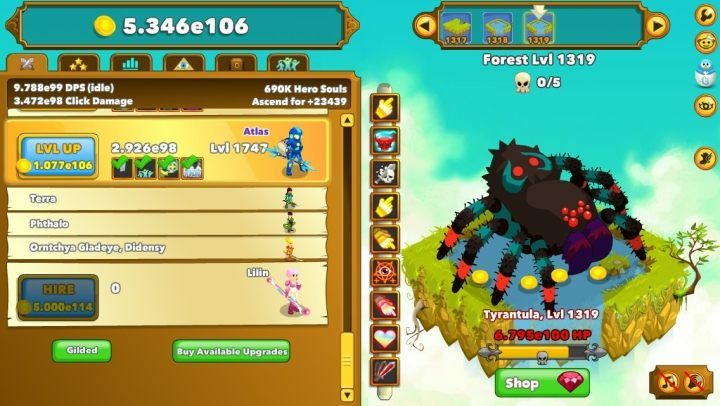 It also introduced elements of online co-op, which were later featured in Clicker Heroes. A typical incremental game can be divided into three stages. The first one usually takes a few minutes – during that time, the player has to do all the clicking themselves to kill monsters and/or collect resources. What they manage to reap during that stage can be invested to increase the profits from every single click and to automate the process – so that the game may eventually take care of the clicking itself. Gradually, with every new purchase, what player can achieve manually becomes insignificant compared to the profits of the automated processes. When players finally decide their mouse could use a break, stage two commences – expansion of personnel and infrastructure for the money made automatically. The damage dealt or the resources collected grow exponentially– tens soon become thousands, then millions, then nonillions, etc. The further you get, the less work you can actually do to help. More and more time is required to achieve the next milestone – sometimes hours, sometimes a whole day. Sakura Clicker – clicking on scantily clad manga characters in order to get more scantily clad manga characters, who will in turn help us to click on even more scantily clad manga characters. That’s the basic premise behind this game. And then begins stage three, the most diversified one. Some games introduce classic RPG elements at this point, others – city management mechanics. Usually, this is the moment when players decide whether they want to continue the ever less effective pursuit of greater numbers, or to reset the game – in exchange for a special resource that will, for example, considerably increase the number of collected points, allowing us to get to the same place much sooner the next time. If you do, the cycle begins again. The special currency can also be invested in other enhancements, which can e.g. lower the cost of buying upgrades. Now, the player starts calculating – should I stay, or should I reset the game? Should the special currency be used to multiply resources, or should I buy upgrades? These are seemingly trivial decisions, but they can seriously impact the pace of growth in the game. 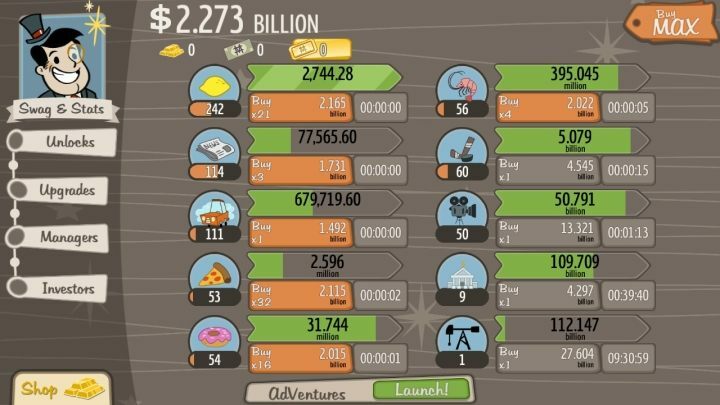 AdVenture Capitalist is another representative of the genre, which offers a crash course on “how to quickly become a trillionaire”. The clickers are immensely popular. Just take a look at the Clicker Heroes' subreddit, where thousands of players have been exchanging strategies and enormous guides that help maximize the progress. Filled with complex mathematic formulas, they go about proving that you’re much better off reaching level 1200 with A than reaching 800 with B, and so on and so forth.